This Christmas season, two in five over 60 year old’s will have the television as their main form of company. 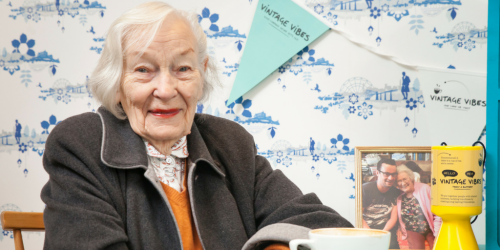 The good news is that Vintage Vibes is on a quest to reconnect older people who are experiencing loneliness and isolation with their local community, new friendships and wider society. But we also need YOU! This year, a number of our VIPs (lonely over 60s) and those on our waiting list will be alone around Christmas. With your help, we can make their lives brighter and cosier. 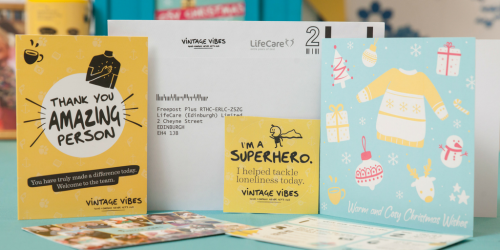 In collaboration with Edinburgh born Gail Porter, we’re asking you to send a FREE Vintage Vibes Christmas Card to someone experiencing loneliness this festive season. Note: You will be charged the normal text rate for your text. Contact your provider for details. We will send you one of our Christmas packs including a profile of a VIP, a blank Christmas card and a FREE POST envelope to send it back to us. Write a friendly message to one of our fabulous VIPs which we will include a profile of in the pack we send you. Visit our FAQ page here for more information. Send your card back in the enclosed free-post envelope or drop it off at Cuckoo’s Bakery at 116 Bruntsfield Place or 150 Dundas Steet and that’s it! Hurrah!